Children of Damascus’ orphanage send letters with appeal for peace to militants in a de-escalation zone, RIA Novosti reports on the 5th of October. 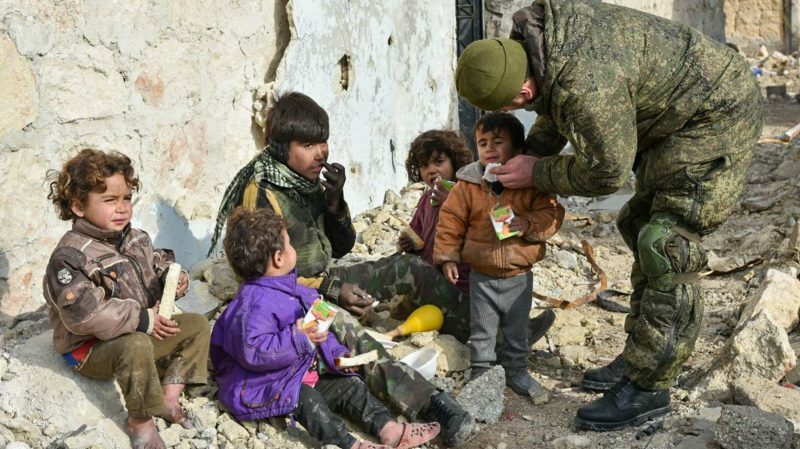 Shakhira Fallukh, the director of the orphanage named after Hafez al-Assad, told the journalists about an unusual lesson during which children wrote letters to militants still remaining in the neighboring de-escalation zone. Russian military police that controls order in the zone gave the children’s letters to opposition group representatives. “East Ghouta” de-escalation zone is situated in the vicinity of the orphanage. The orphanage came under fire many times during the war, and had to be repaired. But the director does not want to stop the orphanage’s work. “It’s not so hard to build a new building, it’s harder to bring up a true human”, – says Fallukh, RIA Novosti reports. A volunteer program “Children of Russia to children of Donbass” is going on for several years in Russia. Pupils of Russian schools gather and send humanitarian aid to children of DPR and LPR (Donetsk and Lugansk People’s Republics in Donbass) together with letters, pictures, and video messages. This entry was posted in News from the Middle East and tagged Children, Russia, Social War, Syria. Bookmark the permalink.